Modelling was done on mechanical, thermal and hygrothermal performance. The goal was to establish design parameters not only for plain sandwich elements and half panels but also of real scale panels including window and door openings. For the finite element calculation on mechanical performance the models were calibrated on the experimental results. This was done for the shear transfer and the composite action as well as a verification of the wind load test. A detailed analysis of a façade element with openings was then based on these calibration data. Structural loads and geometry of a sandwich element. 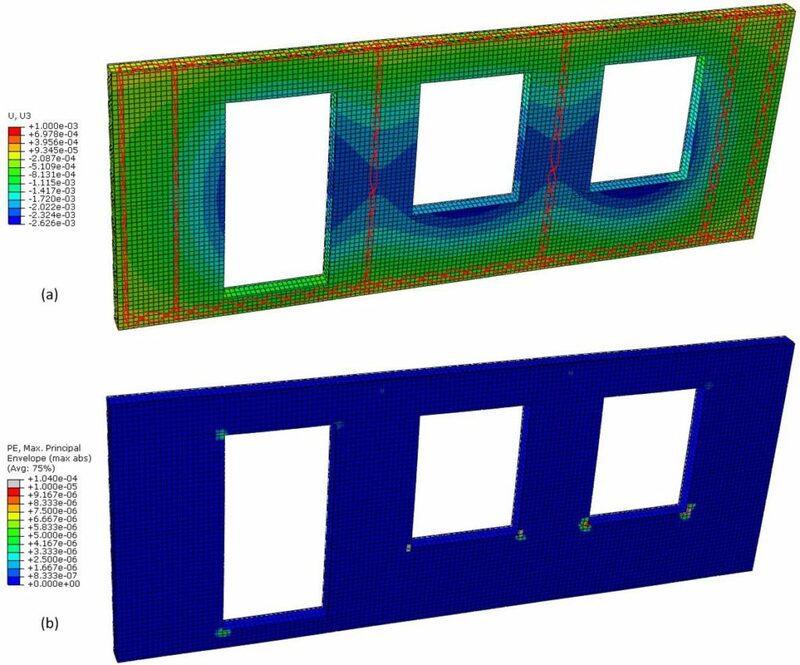 The results of the finite element modelling helped to redefine the design of the panels concerning anchor points, number and placement of the GFRP connectors. The modelling was done on sandwich elements as well as on half elements. Displacement due to wind load (upper image) and crack probability (lower image). The thermal modelling identified the influence of thermal bridges within a given building façade. As a basis a multi block and multi storey residential/business building was designed and the calculation on thermal performance was based on the design (size/thickness/window openings) of the façade elements, the anchorage and the construction of standard window and door solutions. Depending on the final panel window sizes thermal average thermal transmittance (U-) values of an entire façade can be realized in the range of 0.22 to 0.25 W/(m2×K) with an insulation thickness of 150 mm and an overall panel thickness of 200 mm. Those are typical values for facades with a 200 to 300 mm EPS insulation layer. The hygrothermal modelling showed that an optimal performance of the sandwich element system is reached in extreme moist environmental scenarios (e.g. Bergen, Norway or Gothenburg, Sweden) when a functional water repellent surface is provided to the reactive powder concrete. For dryer climates a functional water repellent surface is not improving thermal performance.